Transparency Market Research (TMR) has published a new report titled “Urinary Incontinence Treatment Devices Market – Global Industry Analysis, Size, Share, Growth, Trends, and Forecast, 2017–2025”. According to the report, the global urinary incontinence treatment devices market was valued at US$ 1.97 Bn in 2016 and is projected to expand at a CAGR of over 7.0% from 2017 to 2025. High prevalence of urinary incontinence and overactive bladder across the globe and technological advancements such as non-implantable electrical stimulation devices are likely to boost the growth of the global urinary incontinence treatment devices market from 2017 to 2025. 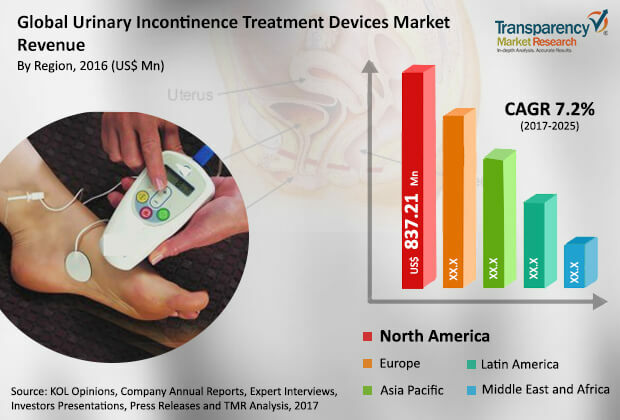 North America and Europe are projected to dominate the global urinary incontinence treatment devices market in the next few years due to rise in demand for minimally invasive surgery/devices for urinary incontinence treatment, favorable medical reimbursement policies, and rapidly increasing geriatric population. Asia Pacific is projected to account for significant market share by 2025. This is attributed to large urinary incontinence patient base in highly populated countries such as India and China, large geriatric population in Japan and increase in adoption of technologically advanced products in Japan, Australia & New Zealand, and South Korea. Surge in adoption of technologically advanced products manufactured by key manufacturers such as Medtronic plc, Boston Scientific Corporation, and Cogentix Medical is likely to drive the global urinary incontinence treatment devices. The urinary incontinence treatment devices market in Europe is expected to expand at the highest CAGR of 7.0% from 2017 to 2025. Urinary incontinence is one of the highly prevalent and largely underreported and under-diagnosed urological disorder worldwide, affecting millions of people having severe impact on physical, psychological as well as emotional health. Women are more affected than men and the incidence increases with age. Several factors such as weak pelvic floor muscles, urethral sphincters, obesity, pregnancy & childbirth, urinary tract infection, neurological disorders, and other related factors cause urinary incontinence. An estimated 200 million people across the globe are affected by some form of urinary incontinence or bladder problem. Stress urinary incontinence is the most common form affecting millions of people globally. Various studies suggest that 24% to 45% of women above 30 years suffer from stress urinary incontinence. Large number of patients with stress urinary incontinence and overactive bladder symptoms is projected to fuel the growth of the global urinary incontinence treatment devices market during the forecast period. The report offers detailed segmentation of the global urinary incontinence treatment devices market based on product, incontinence type, and end-user. In terms of product, the electrical stimulation devices segment is poised to account for leading share of the global market during the forecast period from 2017 to 2025. Factors attributed to the high share of the segment include rise in demand for minimally invasive/wearable and non-implantable electrical stimulation devices to strengthen the pelvic floor muscles, high success rates with electrical stimulation devices, and favorable medical reimbursement policies in developed countries for implantable electrical stimulation devices. Development and launch of new electrical stimulation devices for percutaneous tibial nerve stimulation for the treatment of overactive bladder (such as Medtronic plc’s NURO System) is projected to drive the segment during the forecast period. Moreover, recent launch of wearable electrical stimulation device INNOVO by Atlantic Therapeutics and rise in demand for FDA-approved over-the-counter electrical stimulation device by InControl Medical is estimated to propel the segment during the forecast period. In terms of incontinence type, the urge incontinence segment is projected to dominate the global urinary incontinence treatment market during the forecast period. The segment is estimated to expand at a CAGR of 7.2% from 2017 to 2025. Millions of people across the globe are affected by overactive bladder leading to urge incontinence. Dominance of the urge incontinence segment is attributed to comparatively high cost of treatment devices for urge incontinence, especially implantable electrical stimulation devices, than other treatment devices/methods. Therefore, rise in incidence of urge incontinence, increase in adoption of electrical stimulation devices for overactive bladder treatment, and estimated new product launch in this segment is projected to contribute to the growth of the segment during the forecast period. In terms of end-user, the hospitals segment is projected to account for dominant share of the global urinary incontinence treatment devices market during the forecast period. The segment is likely to expand at a CAGR of 7.0% from 2017 to 2025. The ambulatory surgery centers segment is projected to account for the second leading share of the global urinary incontinence treatment devices market during the forecast period. High share of the segment is attributed to increase in number of surgical procedures for the treatment of all the types of urinary incontinence and favorable medical reimbursement policies for medical devices in most of the developed and developing countries. The home use segment is projected to expand at an exponential growth rate during the forecast period. Availability and high adoption of over-the-counter electrical stimulation and non-invasive treatment devices for effective management of urinary incontinence are the key factors driving the home use segment. In terms of revenue, North America is likely to continue to dominate the global urinary incontinence treatment devices market during the forecast period owing to early adoption of technologies, high patient pool of urinary incontinence, and easy availability and lucrative medical reimbursement policies in the U.S. and Canada. Europe is projected to be the second largest and most attractive market for urinary incontinence, with highest attractiveness index. The market in the region is expected to expand at a high CAGR of 7.0% during the forecast period due to high prevalence and rise in incidence of urinary incontinence in the region, increase in adoption of technologically advanced products, large base of medical devices companies, and large number of products in the pipeline phase for the treatment of urinary incontinence. The market in the U.K. is projected to expand at the highest CAGR during the forecast period. The country is likely to gain market share by the end of 2025. An estimated 15,000 mid-urethral sling surgical procedures (MUS) in women are performed in the U.K. Moreover, high incidence of post radical prostatectomy urinary incontinence in men is likely to accelerate the growth of the market in the country during the forecast period. Asia Pacific is estimated to be the second fastest growing market for urinary incontinence treatment devices owing to vast population in countries such as India and China, large geriatric population in Japan, and overall improving health care facilities in this region. A Key Trend of New Product Development and Launch in the International Market is Observed among the Leading Players. The report also provides profiles of leading players operating in the global urinary incontinence treatment devices market. Boston Scientific Corporation, C. R. Bard, Inc. (Becton, Dickinson and Company. ), Coloplast Group, Promedon Group, Medtronic plc, and Ethicon US, LLC. (Johnson & Johnson) are the major players offering products with proprietary technologies. Several key companies have introduced mini slings for minimally invasive placement of mid-urethral slings with polypropylene sling material. In March 2016, Medtronic plc launched the NURO System, percutaneous tibial neuromodulation device for the treatment of overactive bladder. The NURO System is the second product in the market after Urgent PC by Cogentix Medical that targets the tibial nerve stimulation for the pelvic floor strengthening. Other prominent players in the global urinary incontinence treatment devices market include ZSI Surgical Implants, S.R.L., Incontrol Medical LLC, Hollister Incorporated, Atlantic Therapeutics Group Ltd., B. Braun Melsungen AG, A.M.I. GmbH, and Teleflex Incorporated.